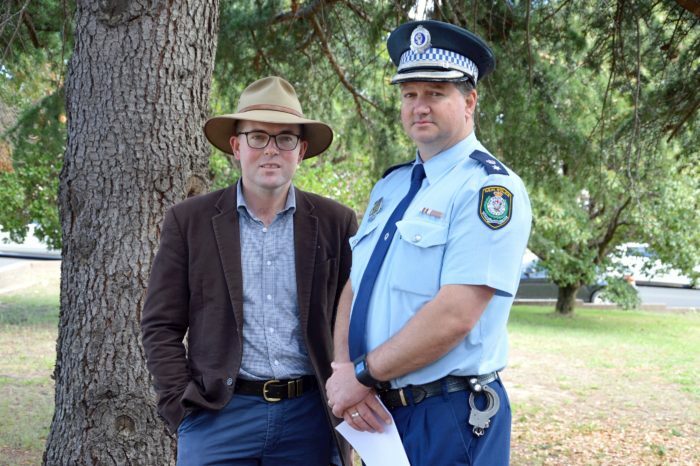 Northern Tablelands MP and Minister for Agriculture Adam Marshall with New England Police District Commander Superintendent Scott Tanner today discussing the planned ‘Dominion’ protests targeting farmers next week. MINISTER for Agriculture and Member for Northern Tablelands Adam Marshall has strongly condemned reports of animal activist demonstrations expected to be held across Australia early next week. Mr Marshall slammed the proposed demonstrations, which would mark one year on since the release of the film ‘Dominion’, a documentary that claims to ‘expose the dark underbelly of modern animal agriculture’. “The people behind this film and these demonstrations will stop at nothing in their quest to destroy legitimate industries and the rural communities they support,” Mr Marshall said. “Earlier this year saw the same people, who masquerade as an animal rights charity, publish a map of farm operations across Australia, including several in NSW. “This irresponsible and disgraceful vigilante behaviour presents a very real and very serious risk to our State’s primary industries as well as individual farmers and their families. In January this year, Aussie Farms, released an online interactive map detailing the locations, operations and contact details of farms around Australia, causing widespread criticism from farmers and industry groups. Mr Marshall said the release of the website and the ‘documentary’ film, potentially encouraged people to enter farms illegally. “I strongly condemn any illegal trespass or activism on farms in NSW as well as any activity that encourages such abhorrent behaviour,” Mr Marshall said. “Not only are farms businesses, they are also the homes of our hardworking farming families and we cannot sit idly by as the safety of our farmers and their families are put at risk. “That’s why our Government has committed to urgently reviewing trespass laws and associated penalties, ensuring we can effectively protect farmers against such extreme and alarming methods of activism. Mr Marshall said NSW farmers are currently facing one of the driest periods on record and the last thing they need is a reckless attack on their livelihoods from extreme and anti-farming activists. “Our farmers are among the best in the world, producing food and fibre that is in high demand around the globe, which is something we should all be incredibly proud and support.